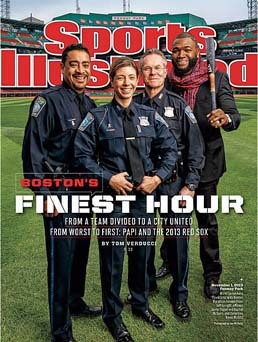 Boston Police Officer Rachel McGuire was featured on the now iconic Sports Illustrated cover. She is pictured with Officer Javier Pagan, Detective Kevin McGill and Red Sox slugger, David Ortiz. On April 15, 2013, less than a mile from the offices of American Police Beat partner Blauer, the world was shaken by the horrific Boston marathon bombing. Seconds after the blast hundreds of local and state law enforcement and emergency medical personnel made the decision to run towards the sites to assist the wounded and control the scene. This level of bravery was maintained throughout the weeks following as local, state, and federal officials worked to ensure public safety and order while searching for the criminals who perpetrated this horrific act of terrorism. We salute the men and women of the Boston Police Department, MA State Police, Boston Fire & EMS, and the local and federal FBI agents for their selfless work in protecting the public during this tragic event. 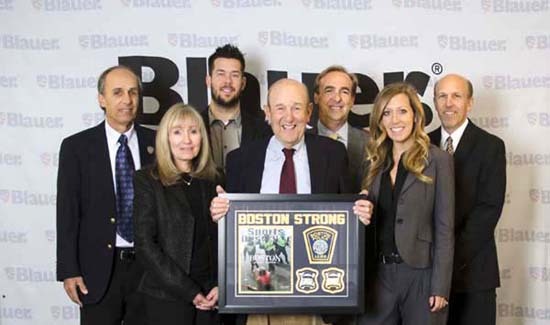 The Blauer team: Left to right: Michael Blauer, Sharyn Proia, Adam Blauer, Charles Blauer (holding plaque) Billy Blauer (behind Charles), Ali Blauer, and Stephen Blauer (on the end).